I’m SUPER excited for next weekend. Why you may ask? Because I’m going on a retreat!! I try to go on a retreat once a year so this ended up working out great. I have been reading about Jackie Francois for about a year. I’ve also been reading her and her fiance’s blog for several months and LOVE everything they write. I also really like her music. So combine that with a super cheap retreat and you have a combination for a great weekend. It is kind of far about 2 hours away but I don’t even care at this point. I need an excuse to get away even if it’s just for 1 night. I couldn’t find anyone to go with me but my mom might drive down with me so I don’t have to drive by myself and so we can get yummy Chinese food on the way home. Last weekend I went to a local meetup as part of (In)Courage’s (in)RL Conference. It was a lot of fun and I blogged about it earlier this week here. Ever since I got a twitter account for my blog I never liked it. The username I wanted @CatholicCouponer was taken (and more annoyingly taken and INACTIVE!) so I settled with @TheCatholicCoup. But people kept asking me if I worked with Chickens or Homeschool Co-ops. When I started this blog I left it alone but last weekend I finally decided I needed a change so I changed it to @BethAnnesBest. It’s more of what I write and tweet about anyway. If you already follow me you don’t have to do anything so don’t worry. 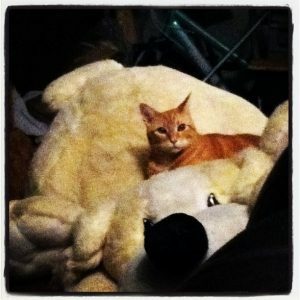 I found this recipe for homemade cat treats. I’m thinking about trying to make them and see if my cats eat them. They look pretty simple with ingredients we have regularly or that are regularly on sale. Interesting Fact: Morocco is the only country in the world where goats due to lack of grass and trees to climb there whole herds graze. I saw Jen post this last week and I thought it was fake. I went and youtubed it and found this video….sooo crazy!! Everyone go wish Emily congratulations as she’s getting MARRIED tomorrow!! I’ve been following her blog since she got engaged so I feel like I have lived through her engagement with her and I’m super excited for her big day and will vicariously living through the wedding via social media on twitter, instagram and facebook. 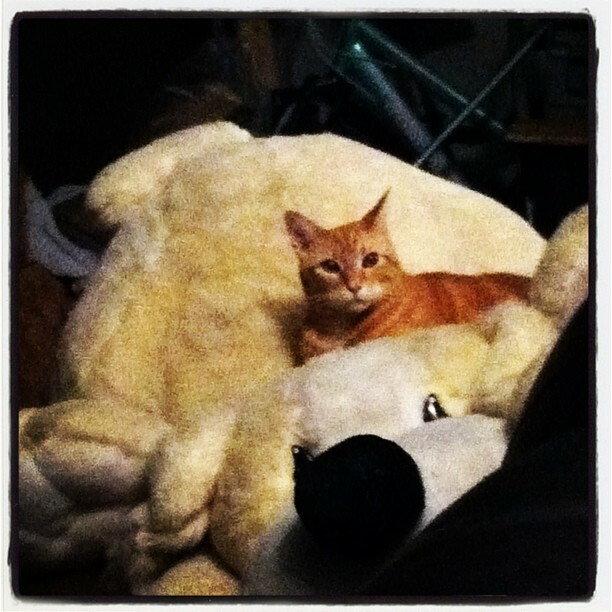 Last weekend my sister bought this HUGE stuffed dog at a thrift store. She put him outside on the patio (I think because he didn’t fit in the washing machine and needs to figure out how to wash it). Well look who decided he would make it his new bed? RETREAT! I am so jealous- have a great time! I’m trying to stay as busy as I can 🙂 Thanks! 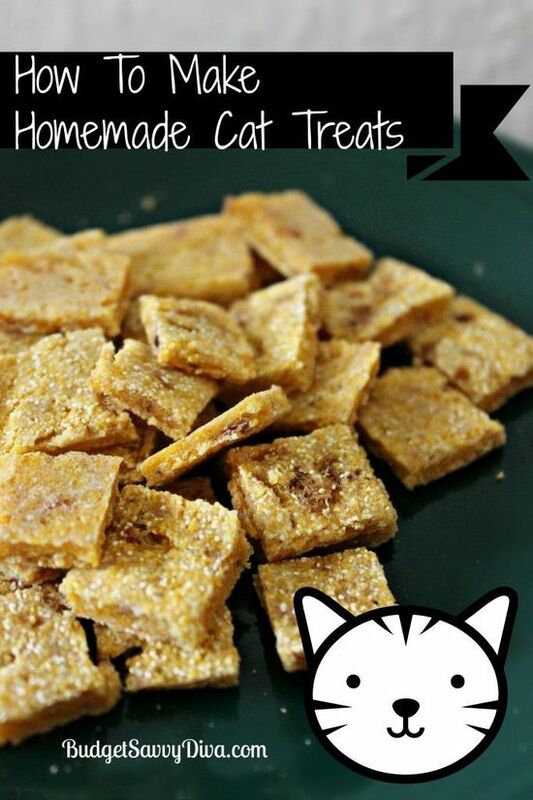 The cat treat recipe sounds wonderful! I’m going to try it with our cat tomorrow. He’ll need a special treat after going to get a rabies shot. Milo is adorable! And your retreat sounds great too. Enjoy it and the rest of your week! Let me know how it comes out. Poor kitty my cats don’t like shots either but they love treats!! Ahhh I am so excited for you! I love Jackie Francois, and I’m sure the retreat is going to be amazing! Thanks! Me 2! Most people are like you are going to drive 2 hours to go to a retreat to see who? And I’m like she is so awesome who cares how far it is! !